The second cata at the Cuatrogatos Wine Fest, lead by the man himself, Federico Ferrer, was short and sweet. At least it was for me: short because I overdid the siesta and rocked up an hour late, and sweet because, well, the wines were sweet, as were the little crumbly pastries we swigged them down with. The sweet stuff isn’t really my bag but these were not your bog standard sweet sherries by any measure. 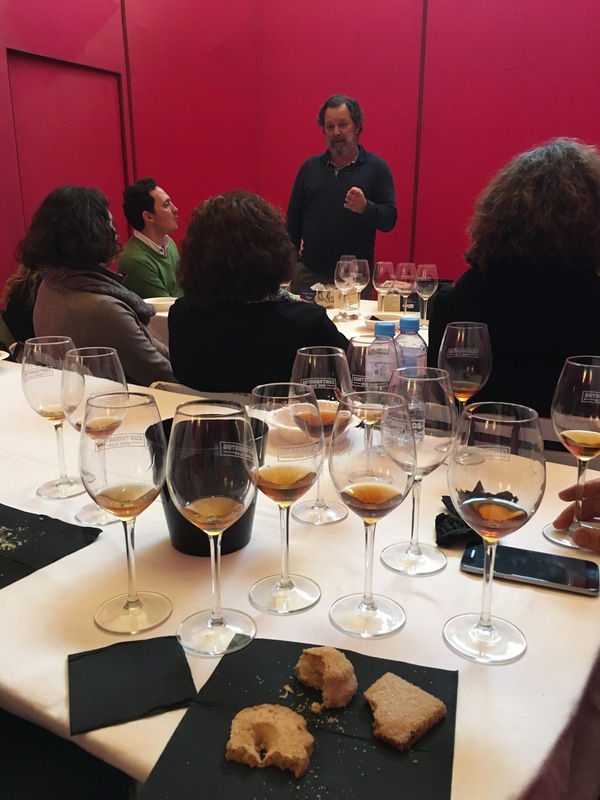 Moscatel Oro “Los Cuartillos” (Primitivo Collantes) was a really cracking start – citrus rich and lush but with nice acidity and a bit of mineral bite, muscle. Nice bit of freshness to it too. Pandorga 2014 (Cota 45) is another favourite – a 100% pedro ximenez that is not as other PXs: sweet, tasty with apricot richness but with nice acidity, like a late harvest riesling. Top class. Golpe Maestro (Federico Ferrer) – the only wine of the lineup I hadn’t tried and a fascinating beast. A late harvest, sun dried palomino that has been two years in half full barrels. Unlike anything I have tried before – has a curious, herbal sweetness and a funky green bitterness (like bitter salad) to it. Really reminds me of the spicey peppery edge to some manzanillas, but more concentrated and with residual sugar. Need more time alone with this if I can get a bottle. Pandorga 2015 (Cota 45) is something else altogether. Ramiro Ibañez at Cota 45 believes in expressing the vintage so in a hot year he harvested even later and left the grapes longer in the sun. Added to the fermentation at high ambient temperatures what you get is a nectar with a staggering amount of sugar and only five degrees of alcohol (so low he can’t call it “wine”). All that sugar is balanced with a lovely acidity and intense apricot flavour and the stuff is far, far too easy to drink. No spitting this one! < Previous Gueuze – Brussels champagne, or Brussels sherry?